Every parent has experienced the embarrassment, frustration, and exhaustion of a child’s temper tantrum. It doesn’t matter what is the diagnosis or developmental stage—and it happens to both the novice and most experienced parents. Inevitably, if you have a child, you will find yourself trying to manage behavioral outbursts. If you’re a parent of a child with autism spectrum disorder (ASD), you have an additional parenting superpower: managing meltdowns. It’s less likely that you can predict what will cause these behavioral and emotional breakdowns from day to day, situation to situation, environment to environment. It can take a super-parent with a bag of go-to tools, flexibility, and a sixth sense to know how to help your child through these moments. Tantrums and meltdowns: none of them are pretty, but for many children and families, they are common occurrences that can be quite stressful. It is important to recognize the differences between characterizing these behaviors. They are not the same, nor should they be addressed in the same manner. A temper tantrum typically occurs when a child is denied what he/she wants to have, or wants to do. Parents observe many tantrums during the “terrible twos,” when young children are beginning to assert independence. In fact, this “terrible twos” stage is typically experienced between one to four years old because it takes a while to develop the needed motor, language, and problem-solving skills! They have an emerging desire to become independent, but have limited motor skills and cognitive skills (planning, organization, execution), making it impossible to actually BE independent. They have emerging, developing language skills that make communicating wants/needs frustrating. The prefrontal cortex of the brain has not yet developed. This is the brain center responsible for emotional regulation and social behavior—so they do not have the ability to regulate! They are developing an understanding of their worlds, and it’s often anxiety producing. This anxiety and lack of control often results in tantrums when it all gets to be too much to manage. A hallmark of a tantrum is that the behavior will usually persist if the child gains attention for his/her behavior, but will subside when ignored. When children tantrum, they maintain control of their behavior and can adjust the level of the tantrum based on the feedback received from adults around them. The tantrums will resolve when the child either gets what he/she wants, or when he/she realizes that this outburst will not result in getting his/her way. When parents “give in” to tantrum outbursts, children are more likely to repeat the behavior the next time they are denied what they want or need. As children age, they develop self-regulation skills to manage the emotions associated with anxiety and anger. If tantrum outbursts persist past what is developmentally appropriate, social-emotional difficulties may arise from maladaptive responses to anger and anxiety. A meltdown occurs when the child loses control over his/her behavior and can only be calmed down by a parent, or when he/she reaches the point of exhaustion. Meltdowns are reactions to feeling overwhelmed and are often seen as a result of sensory overstimulation. Tantrums can lead to meltdowns, so it can be hard to tell the difference between the two outbursts (and respond appropriately) if you’re not attuned to your child’s sensory signals. When a person with autism experiences too much sensory stimulation, the central nervous system is overwhelmed and unable to process all of the input. It’s a physiological “traffic jam” in the central nervous system, and the sensory overstimulation is not unlike a maladaptive response to an actual traffic jam. We’ve all had the experience of happily driving to our destination, cruising down the highway, singing along to our favorite song, when all of a sudden, traffic comes to a dead stop. Now, instead of comfortably cruising (our expectation for the situation), you’re at a standstill surrounded by imposing big trucks, offensive exhaust fumes, blaring horns, and blazing hot sun peeking through your windows. The anxiety of the situation is compounded by the sensations you’re experiencing and, suddenly, the music in your own car is too much to bear (sensory overload). The last thing you want is to be stuck in your car in that traffic jam—you want out! But you can’t go anywhere…the typical response at this point is agitation and frustration. Maybe you shut off the radio, close your eyes, and take some deep breaths to calm down (adaptive response). OR maybe you just can’t handle it and have a road rage outburst (maladaptive response)! In times of anxiety and stress, the sympathetic parts of our autonomic nervous systems produce cortisol hormones and trigger a “fight or flight response.” When people with autism or sensory processing dysfunction experience sensory overstimulation, they are unable to regulate the sensory inputs from their environments and their bodies perceive these inputs as threats. In the meltdown moments, it can be hard to recognize the behaviors as physiological responses and not controllable behavioral reactions. Yet, it is necessary to keep this in mind, as a parent cannot expect logical, rational responses to sensory situations when the child’s body is perceiving those situations as threatening. 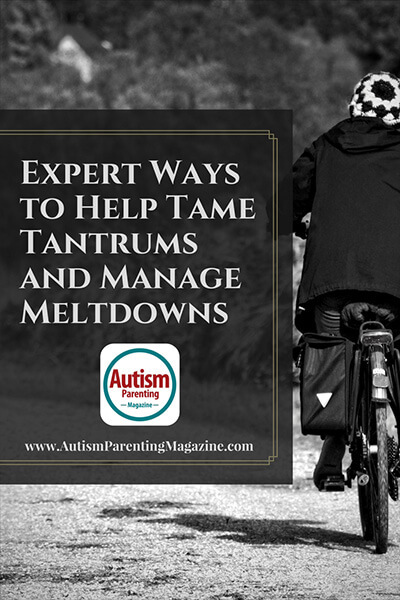 Given the physiological responses happening during a meltdown versus the behavioral reactions happening during a tantrum, the strategies for managing meltdowns are much different than those for managing temper tantrums. How can I tame tantrums? Recognize the motivation or purpose of the tantrum behavior (to get attention, to get what the child wants/needs, denial of want/need, or delayed access to what he/she wants/needs). Once you identify WHY your child is tantruming, you can respond more appropriately. Recognize your child’s needs in the moment, without giving into them. Catch your child when he/she IS responding appropriately to small problems and praise or reward him/her for great behavior. A hug, high-five, or “Way to go!” are all ways of proactively avoiding those tantrum outbursts by teaching your child that he/she has your attention for the times he/she is successful too. Calling attention to what he/she does right, in the moment, will also help the child build on those successes and positively respond in the future! We know that children who demonstrate temper tantrums frequently struggle with impulse control, problem solving, delaying gratification, negotiating, communicating wishes and needs, knowing what’s appropriate in given situations, and self-soothing. Look for opportunities to build on these skills with your child and help him/her be successful. It is best to work on these skills outside of tantrum moments, however. We’d all like to avoid meltdowns completely, but that’s not possible. Instead, some parents find it helpful to put strategies in place to minimize the stress and anxiety of daily life that may contribute to a meltdown. Visual schedules, social stories, check-off lists, and activity or task schedules will be helpful in communicating to your child what is planned, and what the expectations will be. If you’re planning an outing to the mall or grocery store, an online search can turn up actual photos (and in some cases video tours) of the store. Social stories that walk a child through the plan, from beginning to end, will offer predictability and a sense of control that may reduce anxiety. Over time, building in a “surprise” or “question mark” to visual schedules will help to shape behavioral responses to unexpected changes in routines or outings that are often stressful. Routine sensory diet activities are important to support regulation throughout the day. Some parents find it helpful to schedule “quiet time” for their children, in order to allow for the downtime proactively before the activity of the day gets to be too much. This is an important consideration when a trip to a busy, loud shopping mall is in your child’s future! Because sensory meltdowns are the result of events, activities, or sensory stimuli finally culminating in overstimulation, allowing quiet time prior to the community outing may improve your child’s tolerance, or threshold, when it’s time to go shopping. Another key strategy is to get to know your child’s signs of distress. Does the child put his/her hands over his/her ears? Bolt from the room? Say, “Go now!” or “Leave!” or do you notice an increase in self-stimulatory behaviors (rocking, humming, hand flapping, self-injurious behavior)? These signs of distress can be indicators that your child is quickly becoming overstimulated and needs your help regulating before reaching the point of meltdown. Depending on the verbal skills of your child and how he/she accesses those language skills during a meltdown, a low-tech communication board can help the child tell you the basics of his/her needs that may help you leave a situation or put a strategy in place before the overstimulation reaches a critical level. For other children, a predetermined, mutually understood signal (hand gesture, signal word) will be enough to communicate sensory overload. In those meltdown moments, seek out a quiet, safe space. This may mean leaving the place that is causing the overstimulation (mall, grocery store, etc). Allowing your child the safe space to calm down will also mean changing the amount of exposed sensory input. Keep yourself calm, limit the verbal language you use, and offer deep touch pressure input to help your child calm down. In the event that your child tends to bolt (run away) or is unsafe to himself/herself or others, you may need to restrain the child for safety. In a public setting, bystanders may not understand your situation and may not react helpfully to your child’s meltdown. “Meltdown cards” were created by parents to offer an explanation for any screaming, restraining, or self-injurious behavior that may otherwise be alarming to uninformed bystanders. When you’re in the throes of helping your child through a meltdown, meltdown cards may offer a reprieve from the concerned questions or misunderstandings such as any abuse or abduction attempts. This isn’t so much a strategy for your child, but for you. Breathe, and try not to take this meltdown personally. As difficult as it is in the moment, check your emotional reaction (anger, embarrassment, frustration, sadness) and realize that your child is not in control of his sensory reactions at this time. By keeping those emotions in check, you’ll be helping your child get through the worst of it. While tantrums are behavioral in nature, meltdowns have a sensory, physiological basis that warrant different management strategies. While neither are fun outbursts to experience, focus part of your energy on proactively supporting your child’s emotional regulation. In the moments of tantrum or meltdown, use the guidelines we’ve outlined above to find what works for your child. Don’t forget to b-r-e-a-t-h-e as you support your child’s regulation. Autistic Meltdown or Temper Tantrum? by Judy Endow, MSW.” Ollibean. N. p., 10 Nov. 2016. Web. 25 May 2017. “26 Sensory Integration Tools for Meltdown Management – Friendship Circle – Special Needs Blog.” Friendship Circle — Special Needs Blog. N.p., 18 Nov. 2015. Web. 25 May 2017. Bennett, David D. “Decreasing Tantrum/Meltdown Behaviors of School Children with High Functioning Autism through Parent Training.” Social Science. N.p., 04 Feb. 2014. Web. 25 May 2017. Caroline Miller. “Why Do Kids Have Tantrums and Meltdowns?” Child Mind Institute. N.p., n.d. Web. 25 May 2017. Morin, Amanda. “The Difference Between Tantrums and Sensory Meltdowns.”Understood.org. N.p., n.d. Web. 25 May 2017. “Why Toddlers Throw Temper Tantrums.” Parenting. N.p., 17 Feb. 2015. Web. 25 May 2017. Alescia Ford-Lanza, MS, OTR/L, ATP, is an occupational therapist and assistive technology practitioner who specializes in educationally relevant interventions with a focus on sensory integration and assistive technology supports to learning. She is a therapist, consultant, and speaker who works to inform parents, inspire teachers, and include children of all abilities! Alescia is a contributing Advisory Board member of Wolf+Friends and a contributing content writer for Harkla. Through her educational, parent-friendly blog posts, Alescia helps connect families with therapy-informed products and development-minded activities. She founded Adapt & Learn, LLC, with the mission that children of all abilities can play, learn, adapt, and develop with the right therapeutic and educational supports. Alescia strives to help children along this continuum by fostering a love of learning. Really his is very helpful. I will follow his guide line. Noted hat my 10 years old male child suffers autism with meltdown symptom. My family handles him very badly way. Pls give me more suggestion in this reagrad.